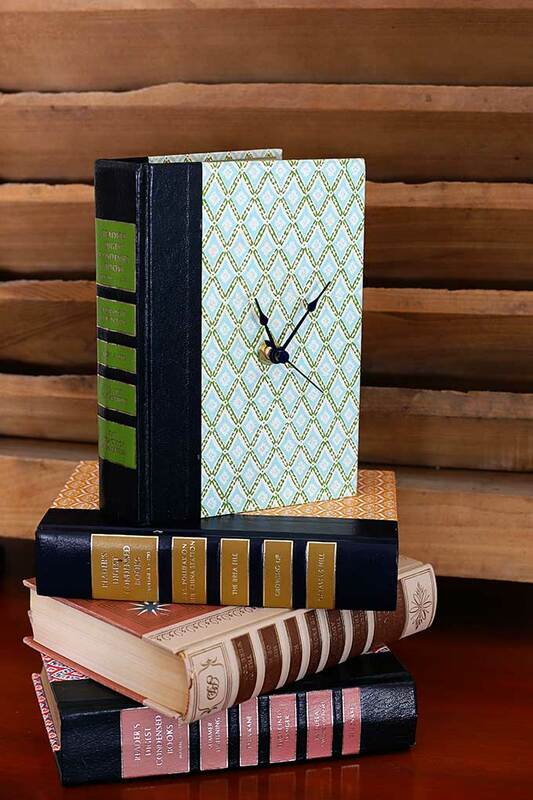 Learn how to upcycle old books into clocks. 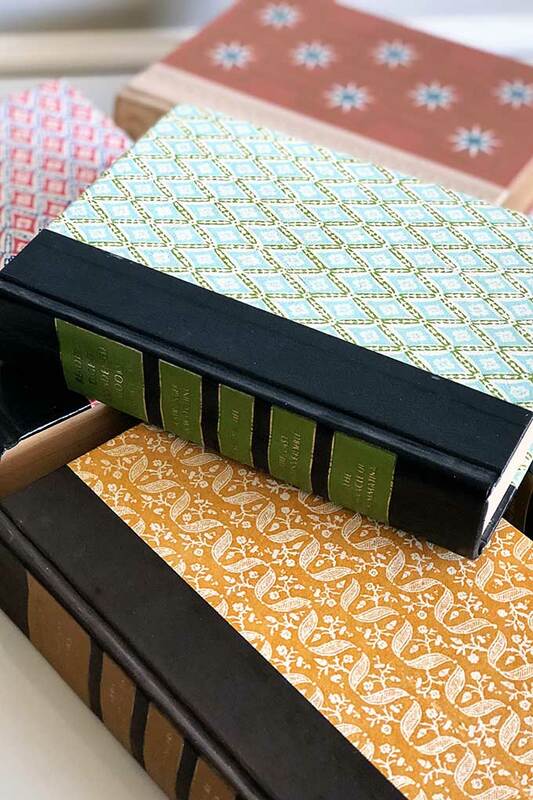 This EASY DIY craft idea is a creative use for old books that keeps them out of the landfill. Reader’s Digest books are basically the doormat of the literary world. Everyone’s grandma bought them, no one ever read them and now they are a dime a dozen (figuratively speaking) at the thrift stores. But they have one redeeming quality . . .
There’s lots of great projects you can make with them that repurpose these old books, but that’s a whole post for another day. Today I am going to show you how to make a SIMPLE clock out of one (there’s both a new-fangled video and old-school style written instructions for you). 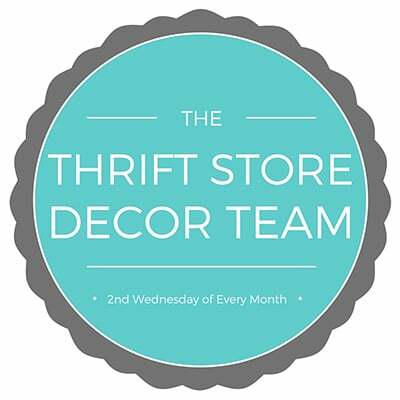 And since it’s the 2nd Wednesday of the month it means it is Thrift Store Decor Team day! Yay!!! 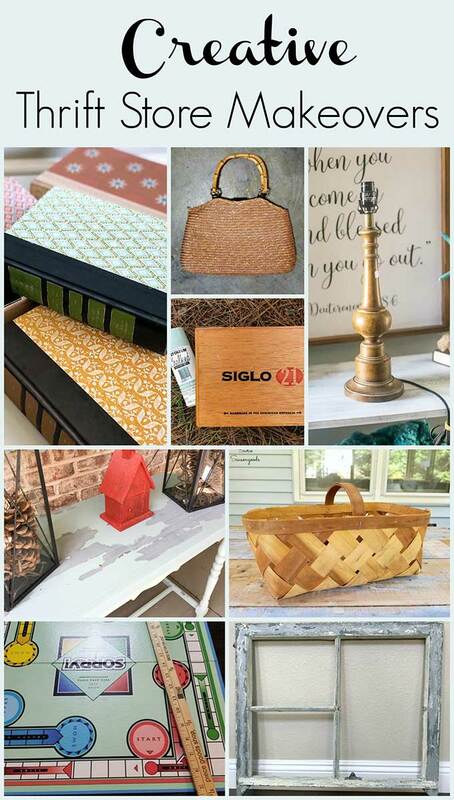 Stop on by and see my teammates’ projects down toward the bottom of this post. If you prefer, you can watch an ad-free version of this tutorial on my YouTube Channel HERE. Figure out where you want the clock hands to be placed on the book (ie toward the top of the cover, in the middle or closer to the bottom). Open up book and trace a box shape around the clock mechanism as a guide to where you will embed mechanism. Cut out the book pages with an Xacto kife. * This is not an exact science, but you generally want to cut down deep enough so the clock mechanism will set flush with the cover. I removed approximately 244 pages (not one at a time, because that would be nuts). Place clock mechanism inside the cutout. Rub chalk or pencil on the pointy end of the clock innards and close the book cover as much as you can. This will mark the spot where you will be drilling the hole. Drill your hole. The drill will make a little bit of a messy looking hole, since you’re drilling through cardboard. Just take a pencil and push the sides down to clean it up. Put your mechanism back in the cutout, put the rubber washer over the shaft and push shaft through the hole. On the cover side of the book, place the metal washer over the shaft. Screw the metal nut tightly down to hold the whole mechanism firmly against the cover. If your clock mechanism has a tiny metal nut at the top of the shaft, unscrew and remove it for now (some clock mechanisms have these and some do not). Press the hour hand (shortest) over the white plastic part of the shaft, then place the minute hand (has the oblong hole) over the metal part of the shaft. Screw the tiny metal nut back onto the top and insert second hand in the middle of the nut. Place battery in the back of the clock. Set clock to correct time and enjoy! *Please be very careful with cutting out the book pages with the razor sharp X-Acto knife. These knives are basically razor blades on a stick and are VERY sharp. Now go on over and see what everyone else is up to this month. Do you realize how many RD book spines I’ve bypassed when scoping out the thrift store books? Like…I never pulled one out from the shelf to see THOSE AMAZING COVERS. What was I thinking?? Definitely checking them out the next time(s) I go. I know!!! I found a couple that were almost mid-century modern looking. Fun covers for sure! 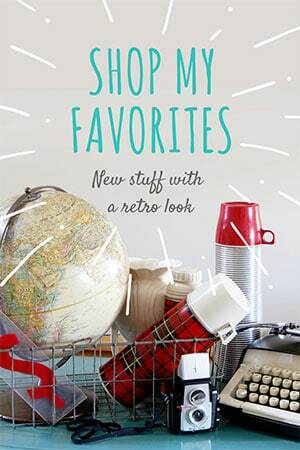 Honest to Pete, I wasn’t planning on going thrifting today…but I’m re-routing my errands in my head so I can swing by and few and see if I find any of these, LOL. Basically you’re my enabler. I’m the nerd (with a short attention span) who actually read the RD Condensed Books! The clock is brilliant, Pam! Me too, I enjoyed them. The covers are beautiful! Me, three. Must be our grandmas bought them and we (now grandmas and great grandmas) read them! I love how this looks, Pam! The old covers are wonderful , aren’t they? 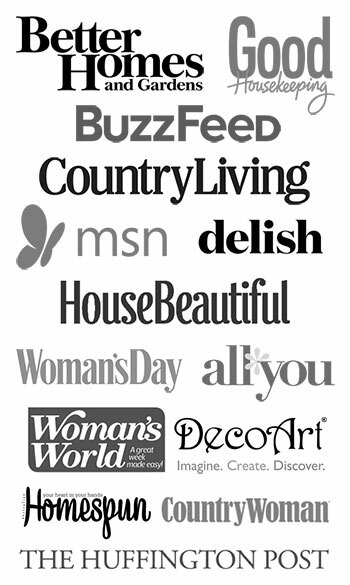 Thanks for sharing…pinning! Ok, this is just too creative! I love it. This month I am finding so many good ideas for my son’s new apartment at college next year!! 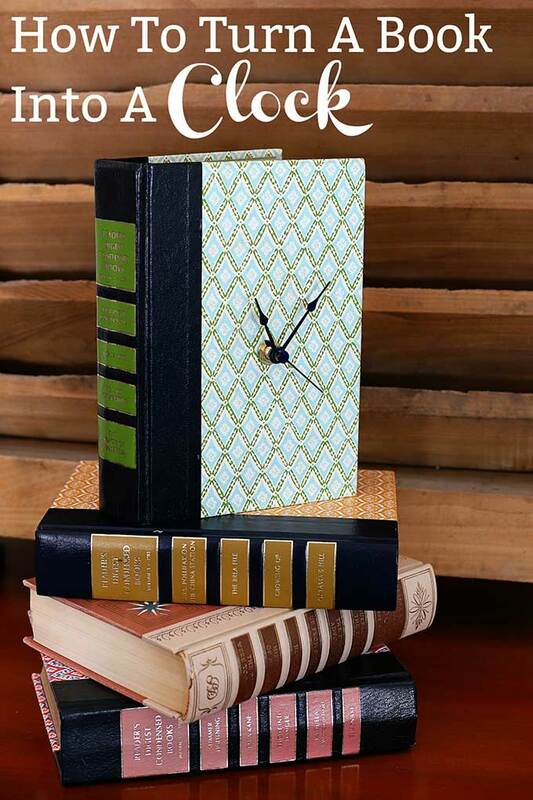 I would have never thought of turning a book into a clock. Well done my friend. This is so clever!!! I love this idea!!! Pam, that’s such a cool idea to use the Reader’s Digest book for a clock! And you’re right, their covers were always pretty and interesting. You have a neat idea, and now you can display that clock right on your bookshelf!